The Cuisinart CSS-11MR is a 11-piece classic cookware set to decorate your kitchen. The 11 piece is made up of Premium stainless steel which offers optimal cooking performance and has wide and easy-grip handles. It has a tempered glass covers which are oven safe up to 350°F. 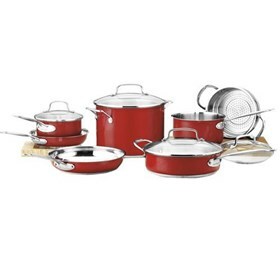 The 11Pc Cookware Set Metallic Red Chefs Classic Stainless has many exciting features for users of all types. You can extend the lifetime of your 11Pc Cookware Set Metallic Red Chefs Classic Stainless with the purchase of a FactoryOutletStore Factory Protection Plan. See the 11Pc Cookware Set Metallic Red Chefs Classic Stainless gallery images above for more product views. The 11Pc Cookware Set Metallic Red Chefs Classic Stainless is sold as a Brand New Unopened Item.